NIA CHARLESTIOWN NEVIS (September 01, 2014) — Young persons on St. Kitts and Nevis have been urged to take advantage of study opportunities provided by the Organization of American States (OAS)in its quest to build human capacity in the Federation and the rest of the Caribbean. 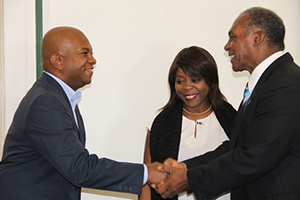 The advice came from Nevisian-born Executive Secretary of Integral Development at the OAS Sherry Tross, when she paid a courtesy visit to Premier of Nevis Hon. Vance Amory at his Bath Plain Office on August 29, 2014. Tross who is based in Washington, was accompanied by the Organisation’s Resident representative for St. Kitts and Nevis Terence Craig. “Everybody knows about the scholarship programmes that we provide. On this one I want to add something very specific because most recently, we have been putting a lot of emphasis on giving opportunities to young people in the Caribbean, particularly those interested in the STEM area – Science and Technology, Engineering and Math – where you will have the opportunity to study whether it’s in the United States, Brazil, Mexico or in Europe and we have those opportunities on line. 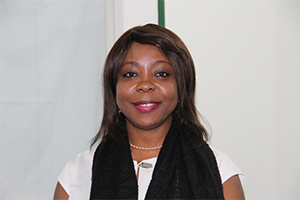 “So please visit our website and find out about those because we want to make sure that we are helping to build human capacity in St. Kitts and Nevis, so that we can benefit from all of the opportunities that there are and that we can be major contributors and drivers of economic growth in the Federation and in the Caribbean,” she said. Tross thanked Mr. Amory for the opportunity to meet with him and noted that she welcomed the opportunity to visit her homeland and gave an insight into the office she held at the OAS. “Thank you Premier. It’s always an opportunity to be at home and to be able to come and speak to the people that I have known ever since I was small and frankly as Kittitians and Nevisians everywhere when we come home and have that opportunity to share what we have learnt outside and how that can benefit the citizens of this country. It’s always a privilege. “In my particular case I am the Executive Secretary for Integral Development at the Organization of American States which means broadly I am in charge of all of the various development programmes – economic and social development, human development, training, education and a lot of our environmental initiatives. So at any given point in time, we are working with 34 member states, to try to support their development and priorities and initiatives and in the case of St. Kitts and Nevis, we have some very specific things that we are doing,” she said. The Senior OAS Official also spoke about her one-day visit to Nevis and what she had engaged in during her visit to St. Kitts and Nevis. “I am going to have an opportunity to visit the geothermal project that we have been supporting for several years. I’ll have an opportunity to continue speaking with some of the grantees we have supported, to do work on natural disaster preparedness and risk mitigation. “I met with somebody in St. Kitts who is working on a sustainable transportation solution for the Federation and of course, we have lots of other initiatives in small and medium enterprise development and support for young entrepreneurs and education. So thank you Premier Amory for having me today it was an absolute pleasure,” she said.